All of those components make for a very powerful programmable robot, but the fun factor of my friend Cue is the part I like best! You can record words and sounds for Cue to emit (my son made it burp, of course) and and the ability to use easy block programming made it simple for me to control. 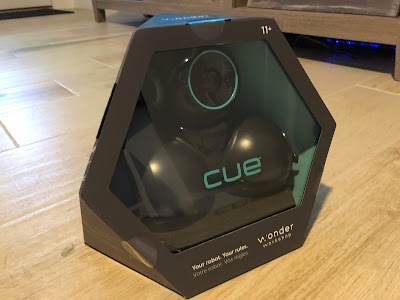 There are some options that are coming soon to Cue including Apple Swift™ programming, detection of the direction of a voice, and the ability to be aware of the proximity of other nearby Cue robots. 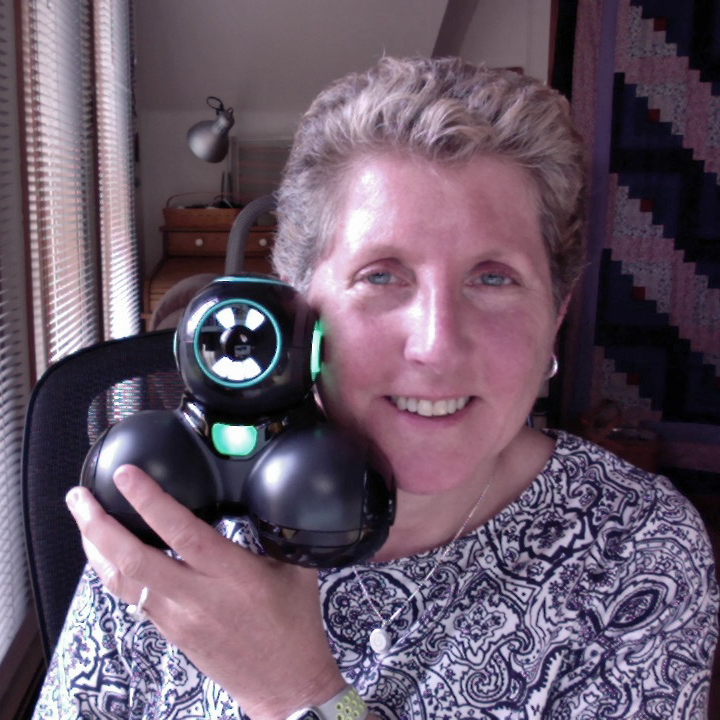 The actual reason Wonder Workshop sent me my new best robot friend was for me to check out their new Sketch Kit. The Sketch Kit is an accessory for Dash and Cue. 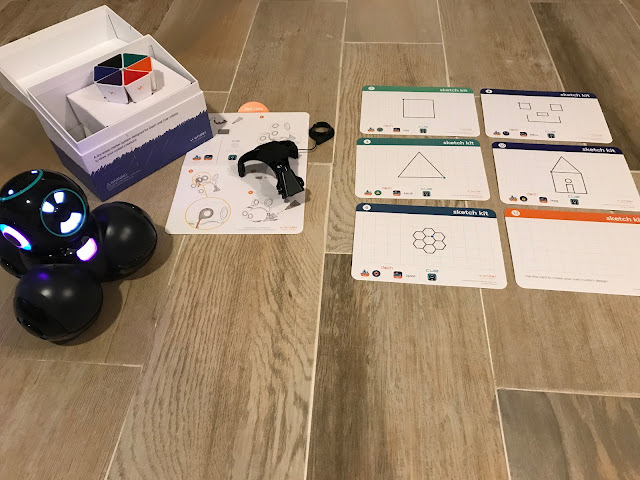 It includes a harness for the robot to hold a marker, six colored markers, and six project cards to help students practice using the Sketch Kit to draw. The Sketch Kit allows students to code Dash or Cue to draw a picture! In addition, there is a large Whiteboard Mat available which allows students the ability to iterate their design and erase the false starts. 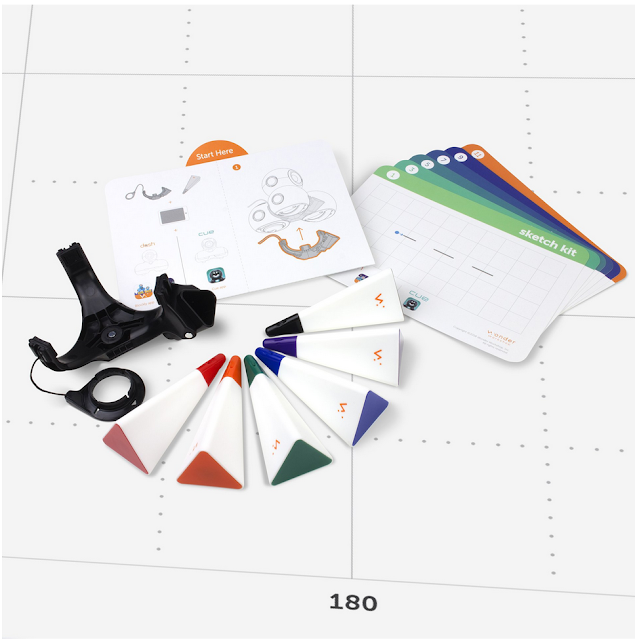 (The Sketch Kit and Whiteboard Mat can be purchased together in the Sketch Pack.) The markers include in the Sketch Kit are whiteboard markers, but I can see students completing their final drawing on a thick white piece of paper from a roll of plotter paper, for displaying of their artistic creations on the walls in the school hallway! The Wonder Workshop site includes a great blog post explaining how to set-up the Sketch Kit with some tips and tricks included. Their site also includes lessons in their education curriculum such as, "Using Sketch Kit with Cue: The Geometry of Mandalas" and "Using Sketch Kit with Dash: Robot Code Breakers", based on Alan Turing and the codebreakers of WWII. I did not read the blog post on the Wonder Workshop site first, but had no trouble setting up the Sketch Kit and Whiteboard Mat. The directions included in the Sketch Kit box were easy to follow! And, as I said at the beginning of this blog post, I wanted time to experiment on my own! Now, remember, I am new to both block programming and the Sketch Kit when you watch the video below. I am sure I will get a lot more creative once I have some practice, but I felt good about my first drawing! In math, students could draw the three types of triangles. The pen can be programmed to go up and down, so Cue could be coded to move to a new space on the Whiteboard Mat to draw each triangle. In social studies, it would be fun to draw a state outline, a rendition of a historic building, or the path of the Appalachian Trail. In science, students could guesstimate the end of the path of a object when ramps are differing heights, since the mat is broken into centimeter areas. They could then roll the balls right onto their drawing on the Mat to test their hypotheses. In ELA, students could illustrate the theme of a short story or a book. And, of course, the Sketch Pack would be a natural fit in the art room! Take a look at both the Dash and the Cue on the Wonder Workshop education site and consider getting a Sketch Pack to add another level of creativity to the coding process! I was contacted by Airtame recently and asked to review their wireless HDMI device which allows mirroring from any mobile device or computer to a projector or monitor/TV. Airtame was a successful Indiegogo project back in 2014, and has continued to improve and update the device as technology advances. It is available for purchase from many of the vendors we use in education. 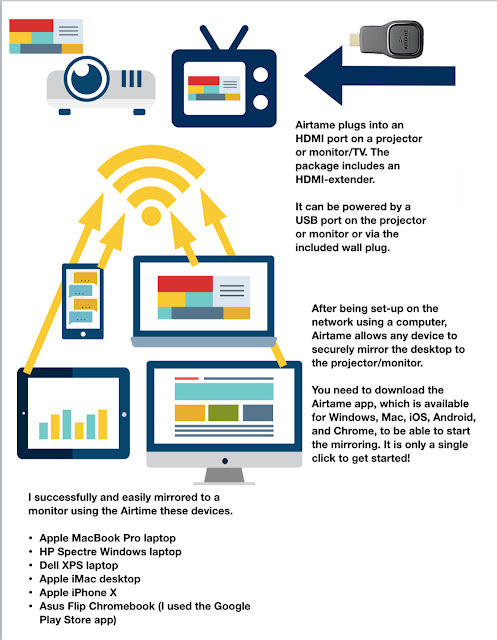 Airtame is intended for enterprise situations like schools and businesses since it includes a cloud-based management tool to monitor multiple Airtames on a network and, more importantly, it works with WPA2 Enterprise and WPA Personal networks. 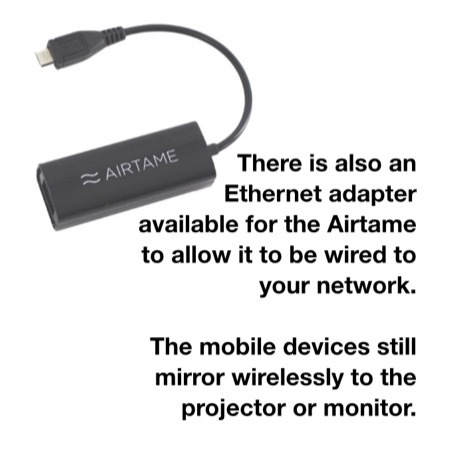 The Airtame would eliminate cables being run from the ceiling-mounted projectors to the teacher’s computer and the teacher could roam with any mobile device and share with the class via the projector. It is perfect for a BYOD environment because it works with any mainstream mobile device students might bring in. In addition, adding an Airtame to a projector on a mobile cart would allow mirroring anywhere in the school! Here is a quick overview of how it works. I can also see it being used at a faculty meeting, attached to the projector, and allowing teachers to share presentations and apps while in their seat using their mobile device running the Airtame app. 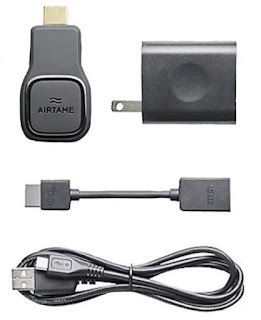 There is much more information on their site (airtame.com) including pricing, information for your IT department dealing with the technical and security side of things, and some ideas for use in education. Their site also contains a section comparing the Airtame to the other casting, mirroring, and streaming devices on the market which provides a sensible overview of the differences. Airtame will be exhibiting at #ISTE18 in Chicago, so, if you are attending, stop in and see them! You can follow them on Twitter at @airtame for updated news on the product. With the exciting announcements recently about Apple's renewed focus on the educational market, and the release of the new iPad 9.7" with Apple Pencil support, now is the time to start thinking about cases for your staff and student iPads! I have long been a fan of Brenthaven bags and cases to protect my technology. Brenthaven has over 35 years of experience ensuring that your items are protected -- initially for hikers and now for the mobile devices of individuals, businesses, and schools! I am the owner of a few of their bags, with my favorites for the 13" MacBook Pro being the an older Vertical Messenger Bag (now replaced by their Collins Vertical Messenger Bag) and the Medina Fold-over Messenger Bag. For my current 10.5" iPad Pro, I use the Edge for 10.5" for iPad Pro because it protects the device as well as allows me to use the Smart Keyboard or Apple Smart Cover to protect the front of my iPad. However, my choice of coverings and cases for my devices are based on the fact I am very careful with my devices. I never drop them, never scratch the screens, and carry them carefully when out of their carry bags. Past experience has taught me that this is not usually how the students treat their technology. Schools are looking for an iPad case that is sturdy, protects the glass screen, can be tilted up for easy typing and drawing, and has a built-in carry handle. 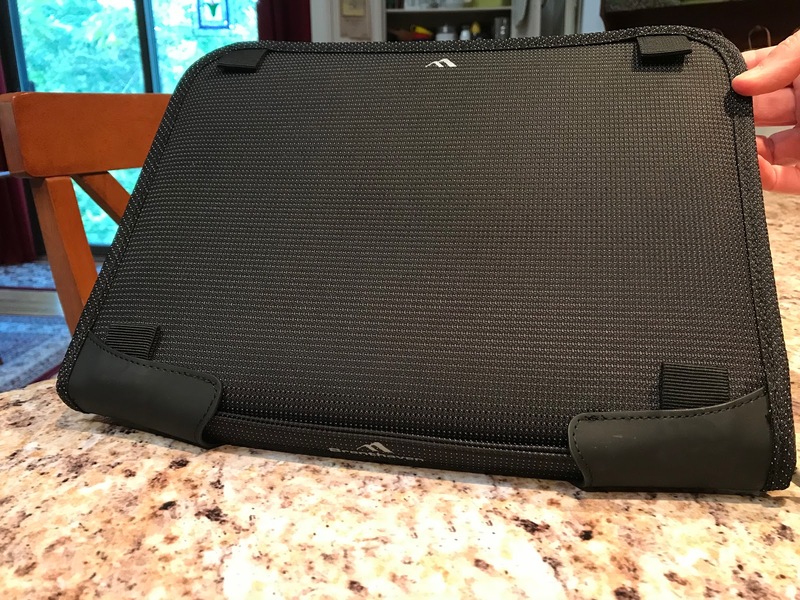 This week, Brenthaven sent me one of their new cases, specifically designed for the education market -- the Brenthaven Edge™ Carry Case which fits the 9.7" iPad (5th gen 2017) and the newest 9.7" iPad (2018). The features of this case meet all the needs of IT departments, students and teachers! 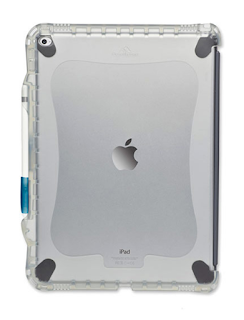 In addition, the back of the case is clear, so any asset tags or barcodes on the iPad can easily be seen. There is a protective clear overlay screen on the front with a cut-out for the home button which should eliminate any accidental scratching of the screen. The access to the Lightning port for charging and syncing the iPads is oversized and should fit any charging cart connection. 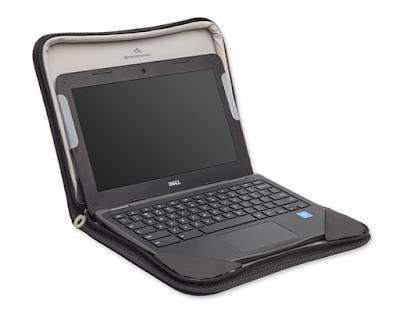 The size of the Edge™ Carry Case is 10.8" H x "7.6" W x 1.25" D and it weights 8.3 ounces. The Edge™ Carry Case has a ton of features that make it perfect for any age student! Secondly, the case is very protective, with no buttons showing except the home button, but the built-in rubber buttons for volume and up/down and turning the device on/off are well-crafted and work great! The headphone port is easily accessible and the speaker cut-out at the bottom of the case lets the sound out well. 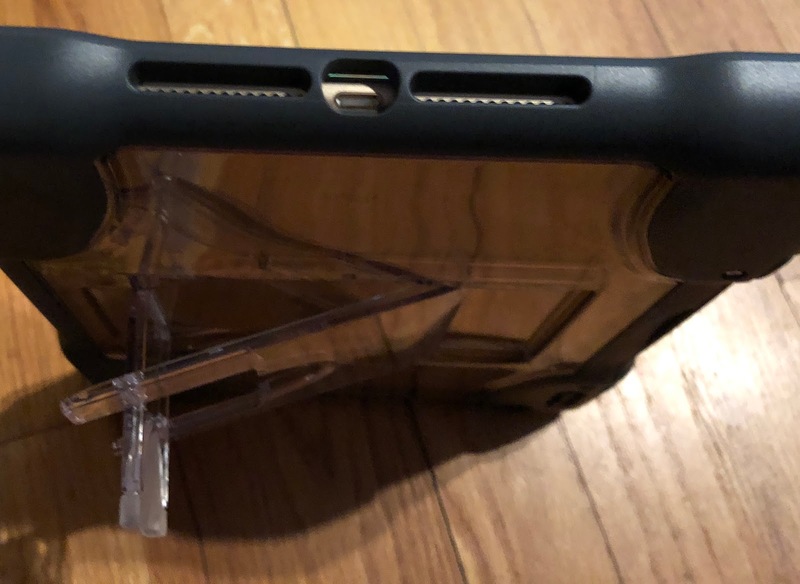 Thirdly, the kickstand feature on the back folds flat into a recessed area on the back of the case, and does not add any bulk. When folded in, it will not get caught on anything when being put in or taken out of a backpack. Fourth, and a wonderful feature, is the built-in handle on the side of the Edge™ Carry Case. When carrying the iPad by the handle on the case, whether the student is in kindergarten or 12th grade, the iPad is secure and should avoid the drops that occur in schools. 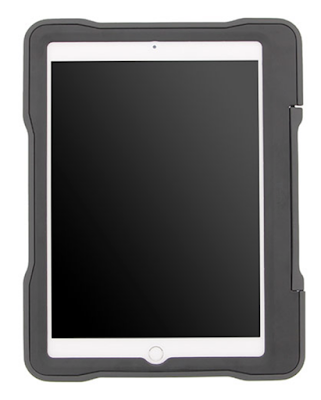 The Brenthaven Edge™ Carry Case is also drop tested to protect the iPad against falls from up to six feet! The handle serves another purpose, too. When students are using their iPad in the field, when in front of the class sharing a presentation, or are reading their textbook on the bus ride home, by putting one hand's fingers through the handle, it allows them to have a secure grip on their device. Using the handle on the Edge™ Carry Case to hold the iPad securely is a great feature for teachers and administrators, too, as they roam the classroom or hallways of the school. In addition, teachers can easily hold the iPad in the Edge™ Carry Case in one hand and use their finger or a stylus to teach over AirPlay or Reflector. 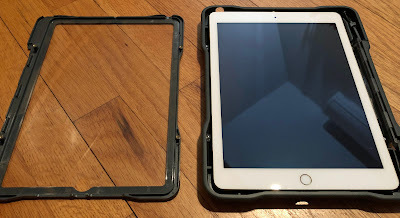 In addition, with its light weight (8.3 ounces), the iPad in the case will be easy to hold for an extended period of time without the hand getting tired. Having the asset tags or student names visible through the clear back of the device, to easily identify a student's iPad or the cart the device belongs on, is helpful for the teachers of the younger students for plugging-in the devices to the correct charging cart. The case is thin enough (1.25") that it should fit in any charging cart slot. 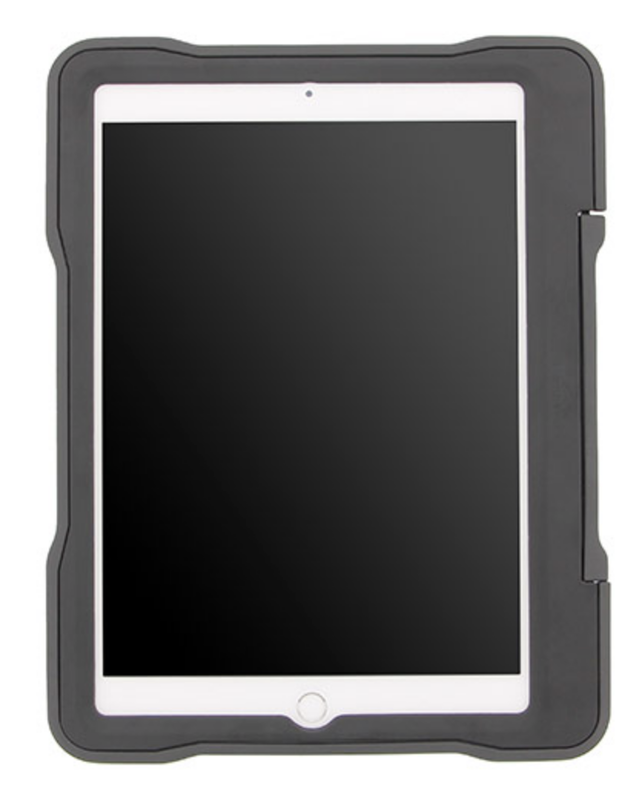 The Brenthaven Edge™ Carry Case for the 9'7" iPad (2017/2018) is available now on their site where you can request a quote for the number you require and receive a free sample of the Brenthaven Edge™ Carry Case. This blog post originally appeared on the Discovery Education site in my blog, Kathy Schrock's Katch of the Month. It is reprinted here with permission. I have much more information and updated AR apps on my Kathy Schrock's Guide to Everything AR page. 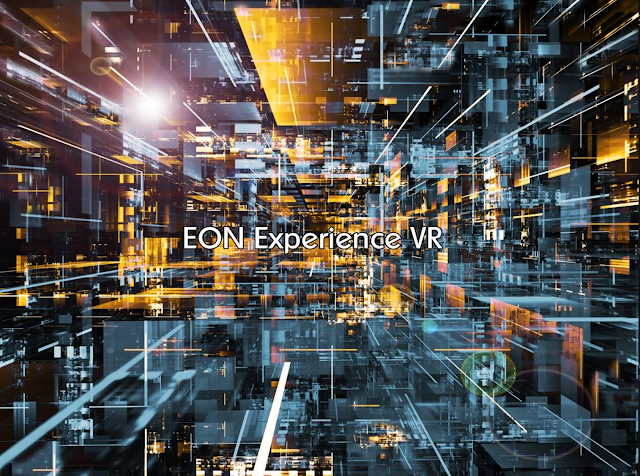 There are also some fun AR apps that allow the creation of place-based AR pop-ups. 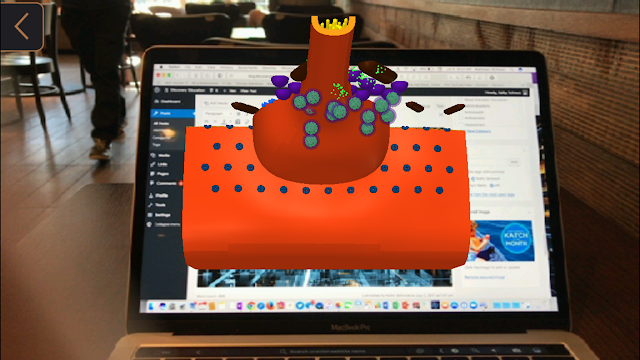 Two that are easy to use for teachers and students are Metaverse and Traces. Users can create quests, descriptors for places, and much more. Imagine the incoming freshman walking around the school and learning all about the building, or a student creating an AR overview of the local businesses as a service learning project. If you are familiar with PokémonGo, you will realize how engaging these pop-ups would be for students to create and share! 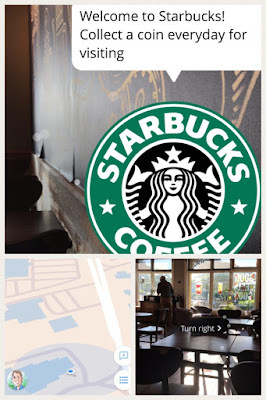 Below is a place-based locator I discovered at my local coffee shop! With cable television and Internet at two homes, I was paying a total of $378 per month to the cable providers. I knew there had to be a way to trim that cost. I spent the last week investigating some options that would meet my needs. I wanted to share what I found out, in case you are considering doing something similar. One caveat: all of the options are updated quite frequently and some options are locale-specific, so your experience may differ! I did not have a list of questions I wanted answers to before I started the process, but now that I have settled on a option, I realize the questions to ask may help you out! Can the service be cancelled at any time? 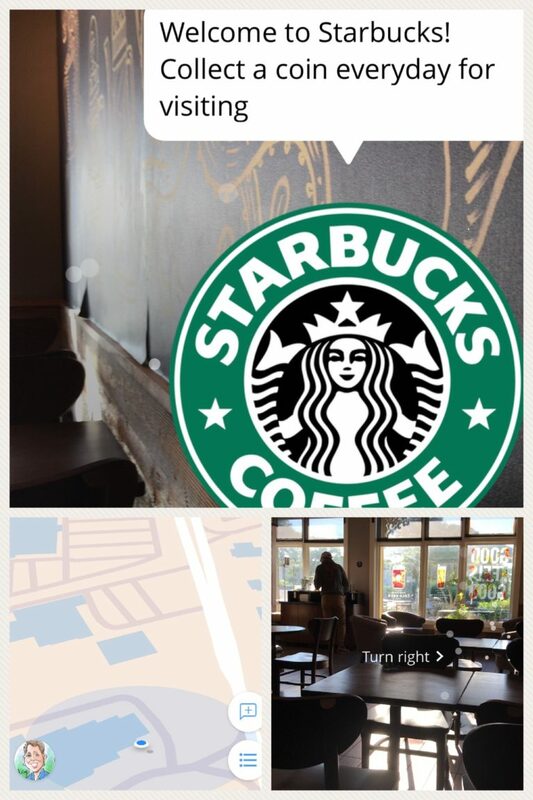 Can the service be used in more than one location? What networks does the service offer? Are local network channels (ABC, CBS, and NBC) available through the service? Do I need any hardware to use the service? Can I share the service with another family member outside of the house? Is there a DVR option available with the service? Are there add-on packages for specific wants? What is the cost of the add-ons? Is there a free trial of the service? What devices can be used to access the service? How many family members can use the service at one time? My goal was to no longer use Comcast (in MA) and Charter Spectrum (in CT) for my television providers. There were many channels I never used, and I felt the cost was too high. I have used a Slingbox for many years to watch my home TV while I was traveling, so I had trust in Sling. Their service is interesting. There are two choices, Orange ($20) and Blue ($25). There are some channels that are in both choices, but the main difference is that Blue allows three streams of channels at once (for example, for a house that has three TV's or mobile devices) and the Orange option only allows a single stream. 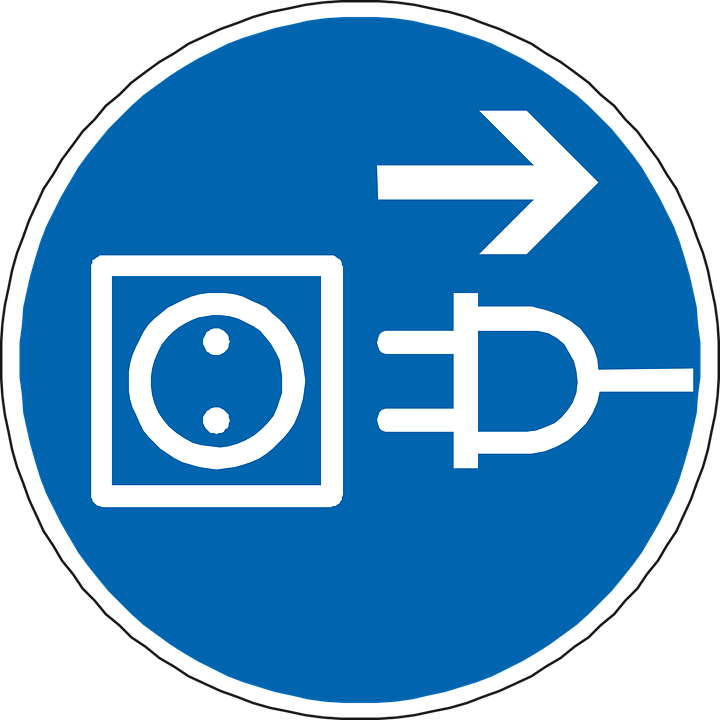 You can use a mobile device while on the road to use the service, and, Airplay with a TV-connected Apple TV. Some smart TV's also have the SlingTV app included. The channel lineup, when purchasing both Orange and Blue ($40) and the DVR ($5) met most of my needs, but there were no local versions of the big three network channels (at least in my area). Matter of fact, there was no ABC or CBS at all, and NBC was only "on demand". There is a cloud DVR available for $5 more per month. I tried the service for a few days of the free trial, and I liked the interface, which includes a grid as well as a search and a browse function. There are also add-on packs that are available for SlingTV for specific wants such as sports, news, comedy and kids. However, because I really wanted to be able to watch local news, and did not want to keep the basic channel package from the cable company, I looked for another option. I decided to go with Hulu Live TV because it did include all the major networks and the local versions of these channels when I was in either house -- Boston channels and Hartford Channels. I was able to cancel both the Comcast cable service and the Charter Spectrum cable service. After a week with Hulu TV, I cannot ignore my loathing of the interface. Maybe because I like a grid, but I find the Hulu apps really hard to both navigate and find things. There are WAY too many clicks. However, it still is the service that best meets my needs. 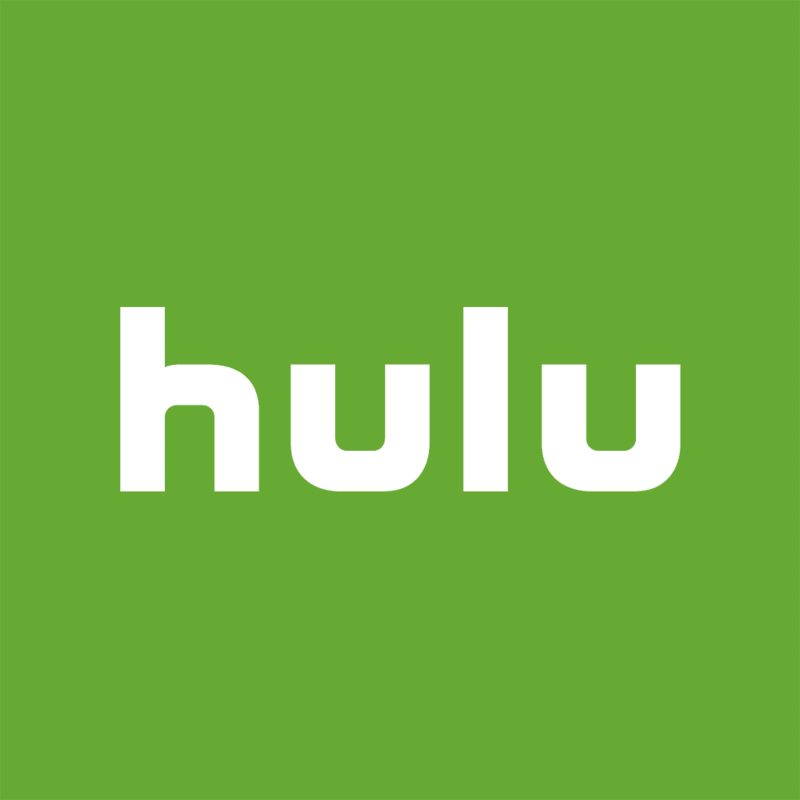 Update 1/22/18: Hulu announced at CES that they WILL be putting in a grid screen in spring of 2008! Yay! However, Hulu Live TV is tied to your zip code as your "home". The company gives you the ability to change your "home" location four times per year. This is for great for people who move, but can also be useful for those that spend extended time in another locale. The home location means you can use Hulu Live TV on the app of one smart TV or via the Hulu app on an Apple TV. You can use any device in your home to watch TV, but only one one person can stream Hulu content at a time. When I am away from my "home" base for Hulu Live TV, I can stream from a single mobile device through a Google Chromecast attached to a television, or simply just watch content on the mobile device (while a person at home can still use the "home" stream). Apparently Hulu is working on the ability to use an Apple TV and Airplay from a mobile device, but it is not available yet. There is also a beta version of Hulu Live TV service which allows you to watch live television and the DVR recordings within the Web browser on a computer. Once it is in the Web browser, you can Airplay it to the television screen via the Apple TV. I did not investigate PlayStation VUE last week since I read online that, unless you were using the VUE service on a PS3 or PS4 gaming machine, the interface was not very good. One of my friends wrote to tell me the interface had been updated, so I thought I would give it a try. The Playstation VUE service does include, at least here in Boston, the local news affiliates. (You can get a 5-day trial to test it out in your area.) In addition, in the Boston area, we also get NESN, the New England Sports Network. I can log into WatchESPN with my credentials, so I would be fine getting the games I want to watch on ESPN3. And PlayStation VUE allows you to authenticate with your credentials in many mobile TV apps. There are a few weird things about PlayStation VUE. If you want to use a mobile device to use PS VUE while you are away from home, you first have to open the app while on your home network and it will authenticate with a PS3, PS4, Roku, or FireTV. So you would have to have one of these set-top boxes/sticks in your home. There is a Playstation VUE app you can use on Apple TV, but the Apple TV cannot be used for authenticating a mobile device. Differing from Hulu, if you log-on to the app when you are away from home, you cannot get CBS, NBS, ABC, or FOX in the PS VUE app. You can authenticate to the network mobile apps with your PS VUE login,, but cannot watch live TV. For my purposes of watching live TV while I am at the condo in CT, this does not work. The Playstation VUE service allows 5 local streams. However, if you need to have more streams while at home, you have to log-out of a set-top box and wait 3 hours to use the other device. Sounds like a "first world problem", and re-authenticating is not hard, but waiting three hours could be a problem if you want to watch a specific television set in your home. There are three mobile streams available and I am unsure if they count as part of the 5 when in the home. I am a little weary of testing at this time! YouTube TV is another cutting-the-cord option. (Initial channels here. There is an app for Roku, Apple TV, newer Samsung TVs, and other devices. You can also use your Chromecast to cast from your phone or computer. It is $35/month with unlimited DVR storage (programs available for 9 months) and includes local news channels in some geographic areas. The service can be shared with six family members, who have to authenticate their device once every three months, and can streamed by three members at a time. Some channels are not included, such as HGTV, CNN, TBS, TNT, History, AMC, A&E, and Comedy Central. When eliminating the cable box on both Comcast and Charter Spectrum, each company charged more for the "Internet alone" option since the Internet was no longer a part of a bundle. However, on Comcast, my costs dropped from $277 to $102 per month. On Charter Spectrum, the costs went from $101 to $65 per month. So, the savings from cutting the cable company "cord" was $211 per month. Not too shabby! The cost for the Hulu Live TV service with the expanded size cloud DVR is $55 per month. So, my net yearly savings from all of these changes is $1872 per year! For a family, I would probably recommend the SlingTV Blue and Orange services and the shared DVR, which would allow several family members to watch television at a time. However, most families may want to keep the "basic cable" package to have access to their local big three networks and PBS. Some of my friends have suggested other options, too, like DirectTV Now, and the use of an HD over-the-air antenna for the local channels (if that is available in your area) and adding on a streaming service. It is like comparing apples and oranges since it depends on where you live, if you have decent Internet bandwidth, and the type of networks you are interested in. One other thing to be aware of. Some cable providers have a monthly cap on streaming usage. Xfinity does in some states. You can find out more about the 1 TB cap from Xfinity here. If you want to see your current data usage on Xfinity, log-in to your account, pick the SERVICES tab, the INTERNET choice, and you will see VIEW DATA usage on the right.